As impressed as we were by the reference design for the Nvidia GTX 680, we've been holding our breath waiting for the actual manufacturer's SKUs to tip up, and here is the Gigabyte GTX 680 Overclock Edition. This Gigabyte OC edition comes with the excellent Windforce cooler, which incorporates three large fans atop an equally chunky heatsink covering both the memory and the GPU itself. Running through the heatsink are the fat copper heatpipes that draw away the heat. With the increased thermal management power of the Windforce cooler, we should see some extra gaming performance too, so what can the Gigabyte GTX 680 deliver? While the GPU cooler obviously has a massive effect on the performance of a card, it's not the only thing that has a bearing on it. Gigabyte has redesigned the PCB to its own specifications and the most obvious change being the addition of an 8-pin PCIe power connector in place of the piggy-back twin 6-pin design of the reference card. That means the card can draw a lot more power; up to 300W compared to the 225W maximum of the reference design. That also means that this overclocked card will require a beefier PSU too. As well as that, Gigabyte is using its Ultra Durable tech, which uses high-end components and a hefty 2oz of copper in the circuit board. The extra copper is responsible for some extra cooling too. We can say for certain that Gigabyte's Windforce GPU cooler, combined with that extra copper in the PCB, makes for one seriously chilled graphics card. The reference board can hit up to around 88°C when under full gaming load this OC edition barely gets above 60°C. All that, with higher clockspeeds out of the box than the reference editions. The standard base clock comes in at 1,006MHz with a boost clock of 1,058MHz, while this Gigabyte card starts at 1,071 with a 1,136 boost clock. In fact, running Heaven we actually saw the boost clock going up to 1,150MHz. Sadly, that cooling doesn't seem to equate to higher clockspeeds when it comes to any extra overclocking. We could only garner a GPU offset of +75MHz to the base clock, though that did have the GPU wavering between 1,215MHz and 1,228MHz. Yes, that's a huge boost to the base clock, and gives fantastic benchmark results, but the reference card is as capable of hitting those clocks as well. Out of the box the Gigabyte Overclock edition is certainly faster, cooler and quieter than the reference edition from Nvidia, but it doesn't necessarily offer a huge amount of extra gaming performance for the amount of extra cash you'll be forking out for this card. That said, the fact it offers a thermal delta of over 20degreesC means that the card will happily remain at its overclocked state without over-stressing the GPU or your ear-drums. The benefit of the Gigabyte Overclock Edition then is the fact you can be reasonably confident you'll still be hitting those heights a year or so down the line, with the GPU itself consistently remaining much cooler, and quieter too. Is that enough of a benefit for you to pay the extra cost over the reference design card? Part of me thinks that if you're spending £400+ on a card in the first place, you might as well put a few more quid in to make sure you pick the best you can, and the Gigabyte GTX 680 Overclock edition is really pushing for that accolade. Sadly for Gigabyte though the Nvidia GTX 670 has now arrived to make things awkward for all walks of GTX 680 life. And the overclocked iterations of the slightly chopped GK104 GPU, like the Zotac GTX 670 AMP! Edition, make things even worse. 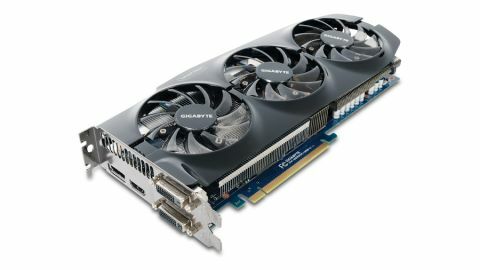 That card performs almost as well as this Gigabyte GTX 680 OC edition. The end result then is that as cool and quiet as this overclocked Gigabyte GTX 680 is the new wave of second tier Nvidia Kepler cards are making the cost of the even the vanilla GTX 680 seem ridiculous. Save yourself £70 and pick up an overclocked GTX 670 instead.